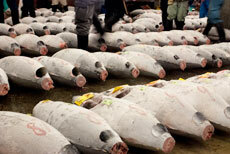 At one time one of the world’s busiest fish markets, most of Tsukiji’s operations were moved to Toyosu in late 2018. Visitors can no longer go inside the Tsukiji market, but there are still many restaurants and shops just outside. 16 min. from Toyosu Sta. or short walk from Shijo-mae Sta.